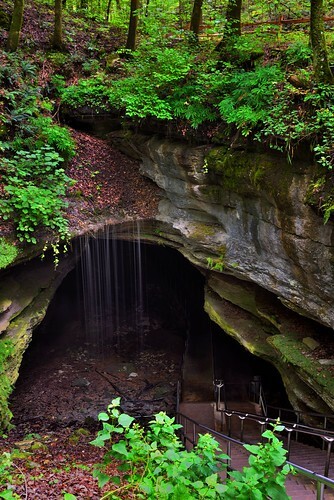 With other images captured at that famous cave entrance in Mammoth Cave National Park I orientated my camera with a more traditional straight on look. Here I rotated my Nikon SLR camera to capture the other part of the surrounding landscape above. The bottom of the image would have the stairs leading to the entrance with water descending across it. Above would be the forest of greens and yellows. That color contrast would then be another contrast of settings to complete the image.